Salento is the most oriental region of Italy, a border land, like a balcony that faces two seas. Salento history always met with the Oriental one, starting from the legend that sees in the inhabitant of Creta the founders of Lecce. This is also due to the Mediterranean facing it and where a lot of civilisations meet. During the Bronze Age the Salento peninsula was inhabited by Indo-European populations. Testimonies of this period are the ten dolmens and menhir that are in the lower part of Salento. The first inhabitants of this land, around the V century BC, were the Messaps who were dedicated to agriculture, horse breeding and pottery. This population gave an impulse to the construction of cities with imposing walls. However, already during the VIII century, Greek settlers founded along the coast cities such as Gallipoli, Otranto, Taranto that would become landmarks of Magna Grecia, small capital cities more prestigious than that of the fatherland. As regards the Greeks presence in Salento, there is still today a linguistic area named Greece of Salento. 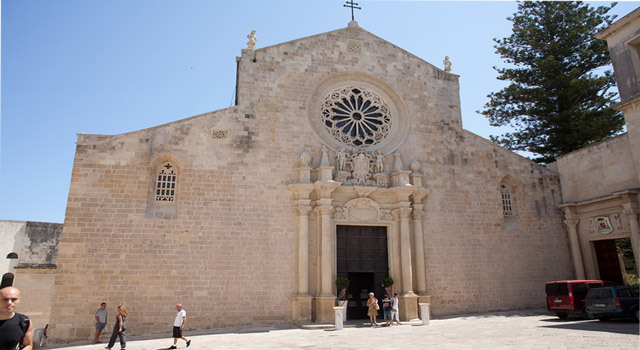 This Hellenic area is located in Lecce province, within the heart of Salento, at South-East of the Salento peninsula. It has very ancient origins: some set the origins of the Greek area during the Byzantine period; whereas others anticipate its birth to the period of Magna Grecia. This ethnic and linguistic minority embraces nine communes: Calimera, Castrignano dei Greci, Corigliano d’Otranto, Martano, Martignano, Melpignano, Soleto, Sternatia and Zollino. Immediately after the war in Taranto,A Salento became a roman province. Romans, conquering Salento, discovered sculpture, painting and the taste for poetry. One of the most important Roman writer and poet was Quinto Ennio who was born in Messapica Rudiae, a city at the gates of Lecce where today there are still archaeological remains. Romans took advantage of their strategic position strengthening the road system coming from the Urbe, making of Brindisi the terminus of the Appian and Traiana Way and building there harbours such as in San Cataldo and Roca. After the fall of the Roman Empire of Occident, Salento underwent the Byzantineand the Norman rule that, together with Federico II, brought the region to be once again the centre of the world. Under the Swabian started a long period of decadence that went on under the Angevin, the Aragonese andA the Spanish vice-regal rule that brought new sacrifices to this land. The peninsula went through a long period of sacks and destruction. The contacts with the Balkan side were intense till the invasions of the Goths, Longobards and Byzantines. The latter ruled for many centuries. The constant penetration of the Orient Church characterised the religious life: firstly with the incoming of isolated individuals escaping from religious and political persecutions, then with the spreading of monacheism in particular the one inspired to San Basilio. The followers of San Basilio built everywhere coenobia gathering around them the population divided between prayers and field labour. Another important but at the same time dramatic period for Salento was the Turks invasion that in 1480 attached and sacked Otranto whose resistance was punished by the killing of 800 inhabitants. This was one of the episodes that started the construction of guard-towers under the Spanish rule, starting from the sixteenth century, during the reign of Carlo V.
Lecce became, during the same period, one of the most beautiful and important city for cultural and artistic activities. Besides attracting nobles and scholars, it also involved the inland with its baroque aspect. While some schools conduct classes exclusively for expats and tourists, there are others that have language course as https://writemyessay4me.org/ part of their regular curriculum.